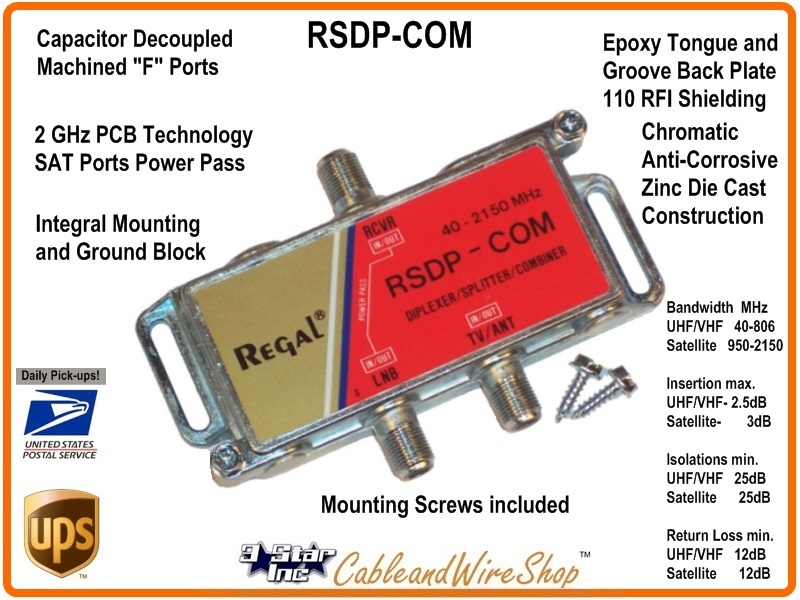 Low Insertion Loss & High isolation design allows off-air and satellite to be fed on a single coax cable. Die cast housing of Chromate Anti-Corrosive Finish with Epoxy sealed cover for good weather protection. Integrated mounting tabs are flush with the back of the housing to provide easy mounting without breaking the tabs. The 1/2 inch flat F-ports with 1 inch spacing provide for easy cable installation. A tongue-and-groove design provides exceptional 110 dB EMI isolation and environmental protection. An integrated heavy duty ground block ensures proper grounding, eliminating the need for additional connections and material.